Port Royal was once a shining jewel of shipping and commerce in the Caribbean on the island of Santiago. 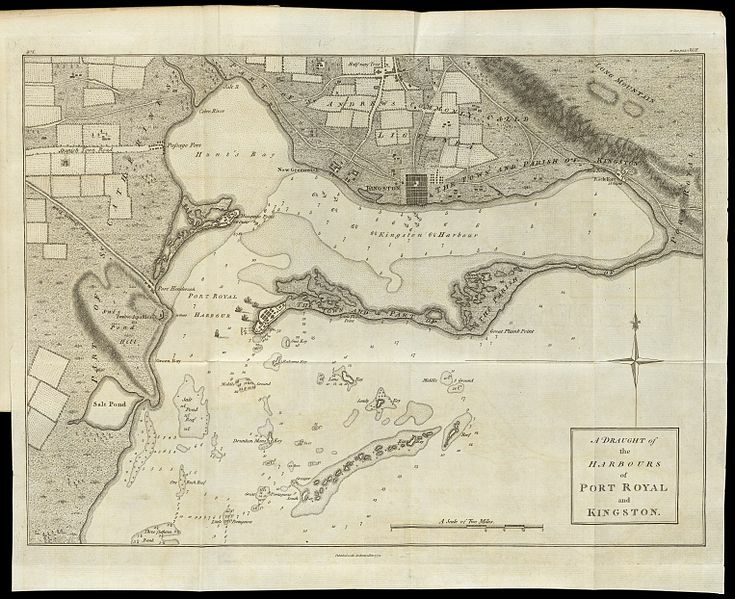 Founded by the Spanish in 1518, the village was built on a sandy spit of land at the mouth of Kingston Harbor. Spain ruled over the island for nearly a hundred and fifty years before it was invaded by the English who took control in 1655 and renamed the island Jamaica. Soon Jamaica had become a chief sugar exporter. By the late 1600’s, Port Royal was one of the largest English cities outside of Europe. It was also known as the most “wicked and sinful city in the world”. Port Royal was a safe haven for privateers, buccaneers, and pirates. How did that happen? First, we must understand why the city was important. The harbor was large enough to receive many ships, upwards of five hundred or more. The waters were deep enough to anchor very close to the shore and bay acted as natural protection from angry tropical weather. 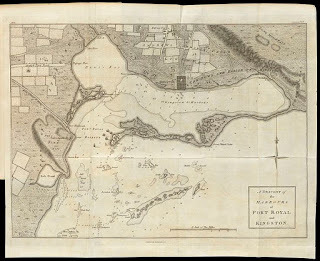 The English didn’t have enough resources to protect their hold of Jamaica and it’s unofficial capital Port Royal. They were surrounded on all sides by an enemy with which they were at war, Spain. And so they turned to privateers and pirates to help defend the city. Situated in a sweet spot between the Spanish Main and the Atlantic, the location was perfect for, say, attacking ships laden with Spanish treasure and launching attacks on Spanish coastal towns. The pirates were pretty much given free sanction to pillage and plunder and the stolen goods would come through Port Royal. Pirates, merchants, and locals became stinkin’ rich, the Crown received a quarter of the gains, and the city was protected. It was a win for all involved. Well, except the Spanish. Yep, life was good in the booming port. Debauchery reigned as spoils were spent. Taverns and brothels were full and rowdy. Even as the England and Spain drew a truce, Port Royal was the place to be to make a fast fortune. The seed had been planted. Craftsmen, slave traders, and entrepreneurs came in droves. The town rivaled cities like Boston and London. Its narrow streets and two thousand two-to-four story buildings crammed on just over fifty acres and boasted of a population of almost eight thousand. And while pirates were no longer needed, a former and notorious pirate captain, Henry Morgan, had been appointed the Lieutenant Governor. Over time, the port was no longer the sanctuary for pirates as it once was. Still, much to the displeasure of upstanding citizens, Port Royal had a reputation of being the “Sodom of the New World”. Drinking and prostitution were as rampant as ever. It had been estimated there was one tavern for every ten people. Wow. That’s a lot of partying. in a matter of minutes on June 7th in a trifecta of catastrophe. At approximately 11:43 in the morning, a massive earthquake rocked the island. The ground split, buildings crumbled. There was no place to hide from the destruction. No place safe. The earthquake was just the beginning. As the ground shook, the water-saturated sand beneath the city separated and became unstable, behaving like quicksand. This phenomenon is called liquefaction. Entire buildings sank straight down into the earth, taking everything and everyone with them. 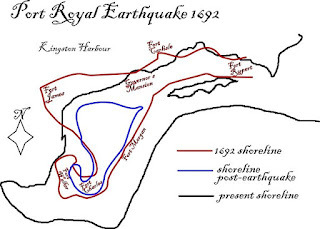 The earthquake shocks reportedly created liquefaction waves. With each passing wave, people became trapped in the ground as the sand solidified, crushing them to death. Unfortunately, that was not the end of it. The earthquake created a tsunami. 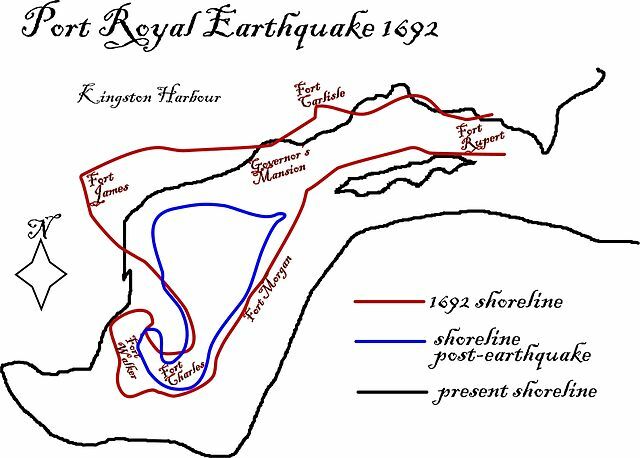 As the tsunami rushed through Kingston Harbor, it bounced off the surrounding shores, sending multiple waves back to batter Port Royal. Once the cataclysms subsided, two-thirds of the city (about thirty-three acres) had sunken beneath the sea and thousands of people lost their lives. The aftermath included a great many floating, decaying corpses and looting of homes, businesses, and bodies. No rest for the wicked. Many in the rest of the world felt that the destruction was divine intervention. But in all likelihood, being built on a sandy peninsula in an active fault zone doomed the port town from the beginning. Though not completely swallowed up by the sea, Port Royal never regained her power and wealth. 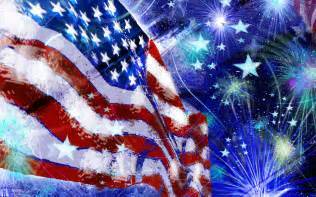 July 4th 1776 didn’t start out as a holiday to be celebrated with family gatherings, picnics, and fireworks. Actually, it wasn’t until 1870, nearly a hundred years after the Declaration of Independence was written before Congress declared July 4th as a national holiday. And it wasn’t until 1939 and 1941 that further legislation regarding national holidays such as Christmas and Easter included July 4th as a day of celebrating the birth of the United States of America. In fact, July 4th wasn’t the day the Continental Congress declared Independence from Great Britain. 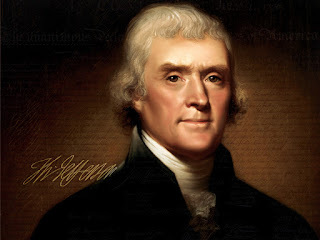 The first draft was written by Thomas Jefferson back in June of that year, and declared on July 2nd. The document wasn’t delivered to a surprised British government until the following November. Still, not much was done in the beginning about celebrating this important passage. In fact, around about 1790, the Declaration became controversial. Bitter conflicts arose between the Federalists, who opposed the Declaration as being too anti-British and backing the French, versus the Democrat-Republicans who were much in favor of Jefferson’s written document. The Declaration of Independence practically fell by the wayside as being questionable and/or of any value. 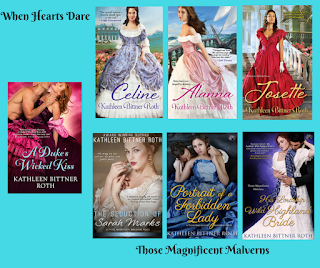 It wasn’t until the War of 1812 when things began to change. This was when the Federalist party came apart at the seams while new parties began forming who favored Jefferson and the questionable Declaration. By 1830 a revised document with the date July 4th, 1776 began to circulate. Perhaps it was the deaths of Thomas Jefferson and John Adams on July 4th 1826 that finally cemented the date as one to be celebrated by an entire nation. As we look back at history undressed, could it be that the deaths of these two men are the real reason we hang out our flags, fire up our grills, make the potato salads, and any other tasty potluck gems as we gather together with our friends and family to roast marshmallows and end our celebration by watching dazzling fireworks light the night sky in a land that remains free and independent of others?